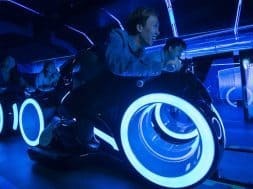 Tron Lightcycle Power Run, which opened with Shanghai Disneyland on June 16, 2016, has long been rumored to be making its way over to Walt Disney World Resort, whether that be in Epcot’s Future World or Magic Kingdom’s Tomorrowland (the coaster acts as Space Mountain’s replacement in the Chinese Tomorrowland). Today, at its biennial D23 Expo, Disney went ahead and made all that speculation official: expect to see Tron Lightcycle, sitting right next to Space Mountain (ironically enough) and open by 2021. The decidedly next-gen ride has been an instant fan-favorite and crowd-pleaser, thanks in part to its thrilling nature (the launched coaster reaches speeds of 60 mph, making it Disney’s fastest), its “cyber-fi” ride experience (in which guests “race” against a CG rival team of lightcyclists), and its stunningly beautiful aesthetics (which come replete with glowing glass rails and a color-changing roof over the massive show building). 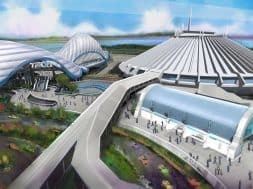 Needless to say, its presence in Magic Kingdom will be an extremely welcome one, resulting not only in a brand-new E-ticket attraction in time for the park’s 50th anniversary in 2021, but also in an eventual makeover and rebirth of Tomorrowland, which is currently expected to arrive in the middle of next decade. 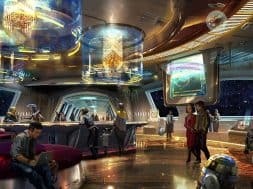 In addition, two other new E-ticket attractions were announced for Epcot (Guardians of the Galaxy) and Hollywood Studios (Mickey and Minnie’s Runaway Railway), along with new transportation options for Walt Disney World Resort (gondolas and Uber-like Minnie Vans), and, the mother of all revelations, a Star Wars-themed hotel. For everything you could ever want to know about Star Wars Land – plus more! – be sure to check out our complete guide. 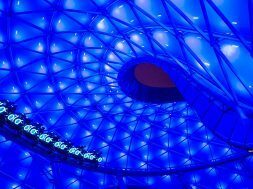 Tron coaster coming to Disney World? Just a note — Your gondolas link actually goes to the Guardians of the Galaxy announcement page. Thought you should know. Now they need to upgrade the Tomorrowland Raceway to electric cars and they could have Tesla as the sponsor.